I did my undergraduate course in Engineering. As a student, I used to enjoy the industrial visits that were organised by our college. I still remember the trips we had to a couple of top manufacturing facilities and I recall being absolutely fascinated by the obsession that they had with maintaining ‘Quality’ and ‘Zero Error’ in production. You could see signages all over the factory floor encouraging employees to maintain high standards of quality and low error. Later, when I moved to the marketing field, after doing my masters in business administration, I noticed that marketers had a much lower ‘obsession for quality’ than engineers. Of course the traditional advertising agencies had multiple quality check processes like copy check, language check, branding check, media check, etc. but it was not upto the level of quality checks that one sees in a manufacturing facility. But in the last few years, with the evolution of the ‘digital’ side of the marketing industry, I have seen the biggest decline and deterioration of the ‘obsession for quality’ in marketing. We are in a day and age where ‘anything goes’ on social media campaigns. Is my content fulfilling the needs of my audience? Am I providing a great experience while fulfilling that need? As a ministry, think about these questions before you post anything on social media. 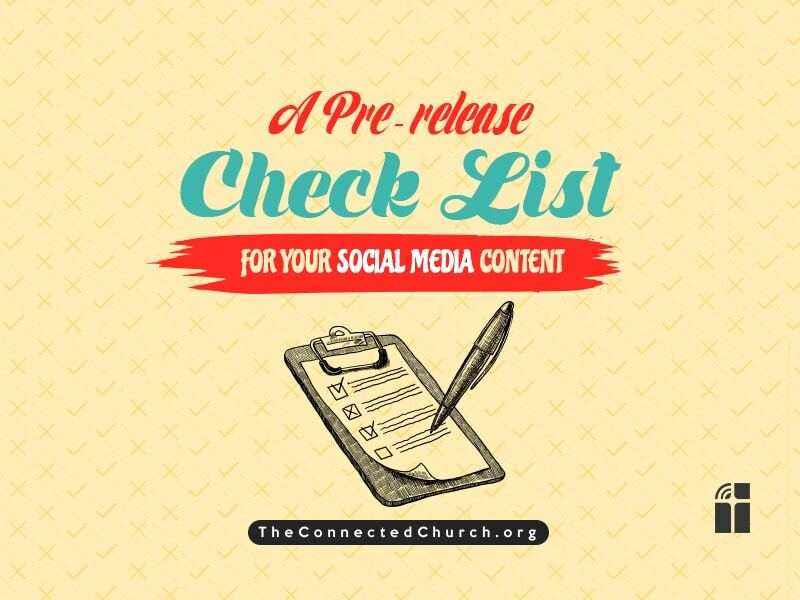 One of the practical items that can help you maintain high quality is a ‘pre-release’ checklist. Think of this as the primary tool in the final stage of an assembly line. Imagine that you are in a car factory, having a final look at a finished automobile one last time before it goes out of the factory on to the roads. Wouldn’t you like to do a quick quality check and make sure everything is ok? 1. Is the content structure easy to consume? Whether it is a video or a blog post structure it well (with sections and subheadings) so that it is not a strain on the audience. Quickly glance or skim through the entire content looking for a smooth flow of content before releasing it. 2. Have you included the right visual elements? Visual elements reinforce the content. If it is a written content you could include an image or a gif. If it is a video content you need to think of the overall visual experience and also elements like video thumbnails that each channel requires. 3. Is there a link back to your content hub? Almost all content that you send out on social media needs to have a link back to your content hub – either the website or a blog. Why? Because what the audience will see on social media is only a sample of the entire content. For example, a short quote will be posted from your 30-minute sermon on ‘How to get out of debt’. Suppose your audience sees the quote and wants to know more. How will they access it? If you add a link back to your website, then your audience can click on it and learn more. 4. Have you included the right tracking codes? There are special tools to help you measure how many people come to your content hub (website or blog) using a specific link. An example of such a tool is the UTM builder. 5. Have you included the right hashtags? You are probably somewhat familiar with hashtags, which are words preceded by this symbol, #, and used on social media. Hashtags are a unique and effective way of gathering content related to a particular topic, so you should create or include existing ones that are relevant to your content. If you have any questions specific to pre-release checklists, please ask using the comments section and I will try to find an answer. You can also let me know about your experience and the workflow that you use before releasing a campaign.